Looking for Birthday Partys?Click HERE for how to register for FitKidz/Kids Bootcamp! Kidz Korner is a place where you can drop off children ages 6 weeks to 9 years while you work out. Children may be in the Kidz Korner for up to 2 hours. *Infants 6 weeks-16 months are welcome by reservation. Contact the front desk at (309) 282-1700 for reservations. Program starts and ends by the RiverPlex Camp Desk outside the Arena entrance. FitKidz uses games and activities to not only get children moving but to teach them the importance of exercise. It utilizes the Rock Climbing Wall, Arena and Fitness Floor. 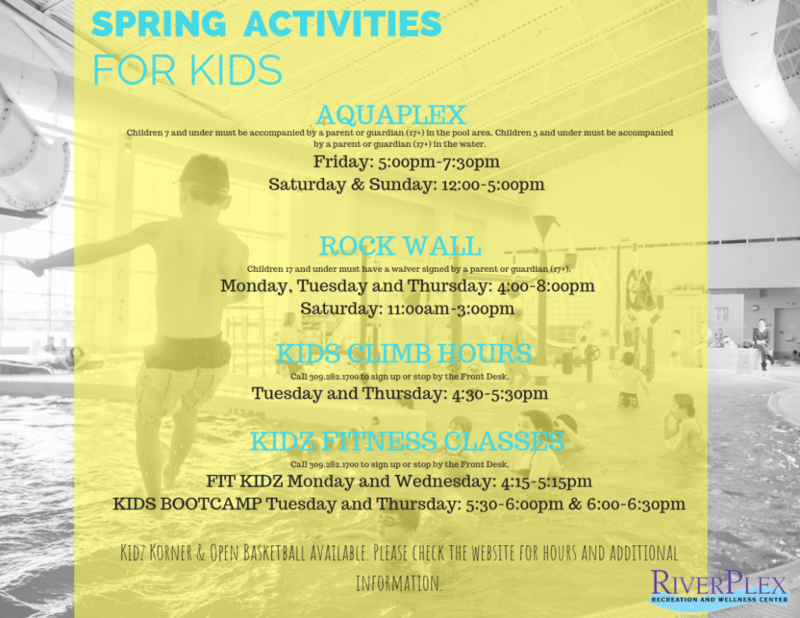 FitKidz is free with your family membership. Pre-Teen Fitness (PTFit) features games and competition for older children. Kids learn basic exercise technique, implementation and education on the fitness floor and training studio. It utilizes the Rock Climbing Wall, Arena, Fitness Floor and Training Studio. PTFit is free with your family membership. Learn the basics of gym etiquette and an intro to the equipment. One-year certification to use fitness floor equipment when a parent/guardian is present. Registration Required. This course will be taught 4 times throughout the year. Fun and friends while focusing on fitness together. This class will take kids through a variety of small group training programs. Circuit training, HIIT, spin classes, and more! Class is for kids mature and responsible enough to handle a structured workout environment. Children ages 7-13 can learn the basics of climbing etiquette, technique, knot tying and more while their parents work out. Call the front desk at 282-1700 to reserve your child’s spot, maximum of 6 each class. Come as often as you’d like. Waivers must be filled out before a child can be dropped off first time at class and must be signed in by adult when attending class.